We come from across the United States and around the world, bringing unique dreams and hopes, pasts and passions, to gather on a campus 25 miles west of Chicago. We’re drawn by a common faith. We’re bound together by a covenant. We’re devoted to a common cause: to discover more of what it means to truly live for Christ and His kingdom. Student-faculty ratio: 11:1; 63.2% of classes have fewer than 20 students. Financial aid: For the 2017–2018 school year, $33.9 million in grants and scholarships were awarded, and $10.17 million in loans were offered; 77% of undergraduate students received scholarships and grants; 20% of enrolled full-time students were Pell Grant recipients. • Wheaton’s Conservatory of Music has moved into the new 80,000-sq. ft. Armerding Center for Music and the Arts in the center of campus, with a recital hall, choral rehearsal hall, recording studios, and a concert hall opening in 2019. • The College boasts one of the top 25 Science departments nationwide, with nearly a third of all Science graduates completing doctorates. 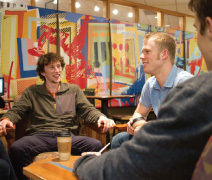 • 22% of Wheaton’s students are from multicultural backgrounds. • Kiplinger’s ranked Wheaton 49th out of 300 in the “Best Value Colleges” list and 27th out of 100 in “Best Values in Liberal Arts Colleges.” Kiplinger’s rankings measure academic quality and affordability, with quality accounting for over half the total. This is who we are: a community of thinkers and movers who want to radically follow Christ. We’re part of a larger community reaching back to 1860—men and women who helped slaves escape to freedom, preached the Gospel worldwide through word and deed, and sometimes gave their lives in the process. Every day we write the next chapter of that story. We immerse ourselves in science and literature, music and economics, art and philosophy. We encourage each other. We play and laugh together. We let God redeem us and redefine our lives by grace. Whether you play a cello, throw a football, or just like to curl up in the corner with a book, there’s a place for you here. On Wheaton’s beautiful historic campus, you’ll be inspired. Within our community, you’ll find yourself encouraged. Go. Engage. Discover. From the influence of friends and professors around you, you almost can’t help but become more of the person God desires you to be. If you think this sounds like a tall order—you are correct! It doesn’t just happen. So we get serious about growing in knowledge and discernment—pushing ourselves academically toward a higher end. That’s why we have a top-tier Science department and nationally regarded Conservatory of Music. It’s why over 96% of our full-time faculty have a terminal degree, with every one of them teaching his or her own class. And although we appreciate that U.S. News & World Report ranks us as one of the nation’s top liberal arts colleges annually, we don’t do this for the rankings. We do all this because education is about relationships—relationships between disciplines, relationships with professors and peers, relationships with the world. Our relationship with God. Rigorous academics help us discover more of ourselves and how we work, more of who God is and how He works. The liberal arts are really the liberating arts. We become freer as we learn. Fuller. Maybe that’s why more of our graduates go on to earn doctorates than almost any other school in the country—they know learning helps us form into new people. To truly become new people, we integrate learning with the deepest thing about us: our faith. Sure, sometimes we have doubts, questions, and fears. But we tackle those together, in part through our learning. That way, everything we learn is colored by the beautiful prism of faith: science is the study of God’s creation, music and art tap into ancient disciplines of expression,and English gives us words of shared experience. We become new people, not just because we’re learning, but because God is at work behind it all. That aspect of faith—God behind it all—draws us out of ourselves. It makes us yearn to experience more of His kingdom. This is why over 1,000 Wheaton students volunteer through the Office of Christian Outreach each year, and others get plugged into local ministries, worship teams, and small groups. Scores of students travel abroad annually to serve. And that doesn’t count the dynamic chapels or prayer time in class as professors get to know more than your test scores. It also doesn’t count the impromptu worship time with friends—with a guitar, over a cup of coffee—as we shape and inspire each other. You see, when we talk about faith, we can’t help but mention each other. And when we talk about each other, one word always comes up: grace. Grace to be yourself, to explore who you are through clubs and organizations, through ministries and missions, through relationships with friends and professors. Grace to be as you are, yet also become more of who God wants you to be. Grace happens when professors grab meals with students—that is, when they’re not inviting the whole class over for dinner—or in the many ways staff members mentor students everyday. 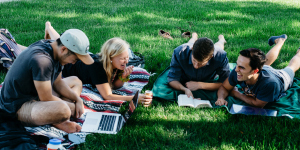 Students enjoy and encourage each other over games of Frisbee or late-night study sessions. We’ve found that when we’re challenged in the classroom, loved by others, and living in a community of grace, we can’t help but become more of who God wants us to be. In every facet of life, we seek to live the stories God wants us to live. We creatively express His image. Our athletes strive together every day, creating lasting bonds and finding great success along the way. Our musicians offer witness by mastering their craft and performing on campus, in Chicago, and around the world. Whether you’re interested in drama, visual arts, macroeconomics, or you just need to kick a soccer ball sometimes, there is space for you to grow and live out that aspect of your story. Plus, Chicago is less than an hour away, with events, ministry opportunities, internships, and just plain fun on virtually every block. But we don’t end there. If you would like an in-depth experience, Wheaton in Chicago offers the opportunity to live and study for a semester in the Woodlawn neighborhood. Students also have the opportunity to study at Honey Rock (Wheaton College’s Outdoor Center for Leadership Development) and our Black Hills Science Station. Students study and serve abroad through our Global and Experiential Learning Initiative in many countries throughout the world. This is who we are. We are a community of people who are fun loving and faithful, living out the stories God has for us. We’ll carry the experiences here with us for life. Our alumni have gone on to study at the finest graduate schools in the nation. They’ve gone on to become senators, musicians, doctors, pastors, and scientists. They have followed wherever God has led. We’d love to get to know you and welcome you as you are! To come for a visit or an overnight stay at one of our Wheaton Connection overnight visit events, check out wheaton.edu/visit. 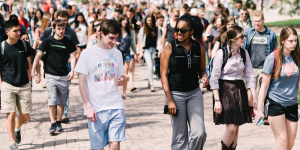 To apply for admission, including via the Common App, head to wheaton.edu/apply. Follow us on Facebook or Instagram @wheatoncollegeil; Twitter @wheatoncollege.